Licketyspit developed out of the Wee Stories Early Years Project (2001-2003), supported by Creative Scotland as a new programme of work, within Wee Stories Theatre Company. This was the first dedicated early years theatre project in Scotland. Virginia Radcliffe was appointed Project Director, writing, directing and producing five plays over eight productions, for six wide-ranging Scottish tours (including visits to Lyric Hammersmith, Birmingham Rep, Nottingham Lakeside and Manchester Royal Exchange) and a site-specific production for the Museum of Scotland. This project enabled Radcliffe to begin her development of what would become Licketyspit’s methodology, practice and a house style of performance and engagement with early years audiences for both nursery/school and family audiences. Teaching resources, Continuing Professional Development (CPD) opportunities, free interactive programmes and occasionally books and audio CDs for families accompanied each production. The project established a core of freelance associate artists and technicians, sharing a desire to push the boundaries of theatre for early years children. The emergence of Licketyspit, coincided with a stringent period of arts funding in Scotland. With the only potential funding then available from the Scottish Arts Council (now Creative Scotland) – project funding -Licketyspit went on to produce at least one show every year for audiences of 7,000-10,000, touring existing shows and developing new ones. Approximately 60% of audiences were public and 40% nursery/schools. The core Licketyspit audience is aged 3-7 years but the work clearly appeals to children up to 12-years and also to parents/carers. It has also shown to be highly successful with children with wide-ranging additional needs and English as an additional language. Developed through rigorous child consultation and drama workshops, the Licketyspit shows are engaging, challenging and demonstrably inspire children to continue to re-create and re-invent their theatre experiences, absorbing them into their play at home and at school for years afterwards; “Your stories have become part of our children’s lives” (Abida Cathcart, Mother, 2010). We are respected for consistently producing quality work and for reaching a truly inclusive audience Scotland-wide; our approach is friendly, open, respectful, gregarious and accessible, allowing us to engage with many families for whom theatre is not ordinarily a part of life. As Project Director, Virginia Radcliffe writes and directs five new plays for early years audiences: Hare & Tortoise; Wee Witches; Quangle Wangle; Molly Whuppie and A Piece of Cake. Between 2004-2008, Licketyspit produces re-mounts of 4 of the 5 plays written during the Wee Stories Early Years Project, as well as 4 new ones! In 2008, Licketyspit obtain Creative Scotland funding to start developing an innovative new project inspired by our audiences. LicketyLeap is a piece of immersive theatre for small groups of 3 and 4 year olds who LEAP into the play! LicketyLeap projects take place in nurseries in Easterhouse, Glasgow and East Lothian. Professor Stephanie Knight, begins to conduct research into LicketyLeap, assessing the work’s impact on children’s social skills, confidence, emotional literacy and problem solving. Knight’s study, ‘Leaping into Ourselves: A Study into the layers of engagement made by early years children through Licketyspit’s immersive theatre project, LicketyLeap’ is published Glasgow Life. Inspiring Scotland, Early Years Early Action Fund awarded major investment for full-scale delivery of LicketyLeap to 800 vulnerable children and families in four areas of multiple-deprivation, as part of a drama-led early intervention programme. In our first year as Resident Company at North Edinburgh Arts centre, Licketyspit produce The Christmas Quangle Wangle, distributing 500 free tickets to local LicketyLeap families and nurseries. A set of 32 beautifully illustrated Lickety Playcards are created by associate artists Wrench & Franks, depicting the games, rhymes, songs and imaginary play used in Porridge & Play. BIG Lottery funding is obtained to run a three-year Porridge & Play project in several communities around Glasgow. 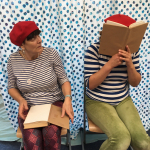 Licketyspit also runs pilots of Storyplay – our bespoke programme of work to develop a story-rich environment, for schools tackling the attainment gap. These pilots take place in Canal View Primary (Westerhailes, Edinburgh) and Oakwood Primary (Easterhouse, Glasgow). Funding is also obtained for a new full-time post within the company – Creative Producer of the Children & Families Network. Picnic & Play and BOOKplay develop out of Porridge & Play. Storyplay and BIG Porridge & Play Glasgow (BPPG) go from strength to strength, with a new school taking up Storyplay and an additional BPPG venue in the same community of Maryhill. Licketyspit trains 5 new actor-pedagogues to work on BPPG and Storyplay. Picnic & Plays are taking place in venues such as Whale Arts (West Edinburgh), the Glasgow Riverside Museum, GOMA, Edinburgh and Glasgow Botanic Gardens, Lauriston Castle, City Art Centre, The Tall Ship and throughout the summer and into autumn! Follow us on Facebook and Twitter to keep up with all our upcoming activities.